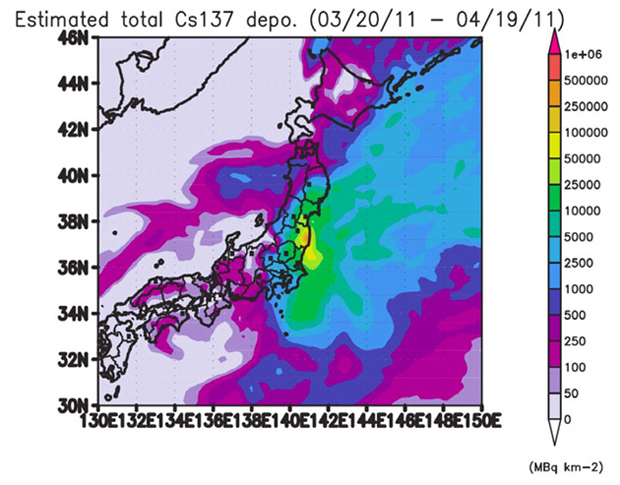 Simulation of atmospheric dispersion of the radioactive plume formed by releases from the Fukushima Daiichi nuclear power plant since 12 March. 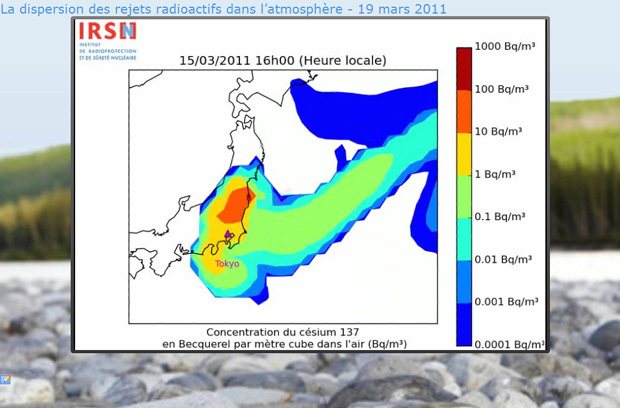 IRSN,March 19,2011. 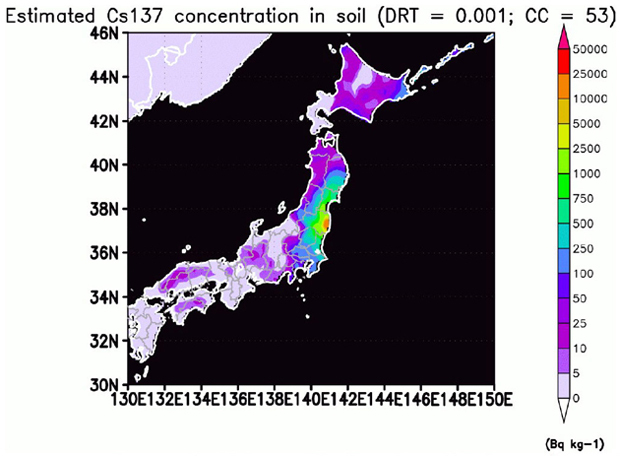 Yasunari TJ, Stohl A, Hayano RS, Burkhart JF, Eckhardt S, Yasunari T.：Cesium-137 deposition and contamination of Japanese soils due to the Fukushima nuclear accident.Proc Natl Acad Sci U S A. 2011 Nov 14. Dissanayake C. Global Voices of Science. Of stones and health: medical geology in Sri Lanka. Science. 2005;309:883-5. Little MP.：Cancer and non-cancer effects in Japanese atomic bomb survivors. J Radiol Prot. 2009:29:A43-59. Consumer Factsheet on: polychlorinated biphenyls US Environment Protection Agency. Brenner DJ, Doll R, Goodhead DT, Hall EJ, Land CE, Little JB, Lubin JH, Preston DL, Preston RJ, Puskin JS, Ron E, Sachs RK, Samet JM, Setlow RB, Zaider M.: Cancer risks attributable to low doses of ionizing radiation: assessing what we really know. Proc Natl Acad Sci U S A. 2003;100:13761-6. Brenner DJ. :Extrapolating radiation-induced cancer risks from low doses to very low doses. Health Phys. 2009;97:505-9. UNSCEAR 2000 REPORT Vol. II: Sources and Effects of Ionizing Radiation: Annex G: Biological effects at low radiation doses. page 160, paragraph 541. Tubiana M.:Dose-effect relationship and estimation of the carcinogenic effects of low doses of ionizing radiation: the joint report of the Académie des Sciences （Paris） and of the Académie Nationale de Médecine. Int J Radiat Oncol Biol Phys. 2005;63:317-9. Allison W :Radiation and Reason: The Impact of Science on a Culture of Fear.ISBN 0956275613. http://www.radiationandreason.com. Kendall G, Little MP, Wakeford R.:Numbers and proportions of leukemias in young people and adults induced by radiation of natural origin. Leuk Res. 2011; in press. Little MP, Wakeford R, Kendall GM. :Updated estimates of the proportion of childhood leukaemia incidence in Great Britain that may be caused by natural background ionising radiation.J Radiol Prot. 2009:467-82. Brohulta A, Holmberg J:Alkoxyglycerols in the treatment of leukopaenia caused by irradiation. Nature. 1954 ;174:1102-3. Deniau AL, Mosset P, Le Bot D, Legrand AB. :Which alkylglycerols from shark liver oil have anti-tumour activities? Biochimie. 2011;93:1-3. Drouet M, Hérodin F.:Radiation victim management and the haematologist in the future: time to revisit therapeutic guidelines? Int J Radiat Biol. 2010;86:636-48. Hirama T, Tanosaki S, Kandatsu S, Kuroiwa N, Kamada T, Tsuji H, Yamada S, Katoh H, Yamamoto N, Tsujii H, Suzuki G, Akashi M.:Initial medical management of patients severely irradiated in the Tokai-mura criticality accident. Br J Radiol. 2003;76:246-53. Lange C, Brunswig-Spickenheier B, Cappallo-Obermann H, Eggert K, Gehling UM, Rudolph C, Schlegelberger B, Cornils K, Zustin J, Spiess AN, Zander AR. :Radiation rescue: mesenchymal stromal cells protect from lethal irradiation. PLoS One. 2011 ;6:e14486. 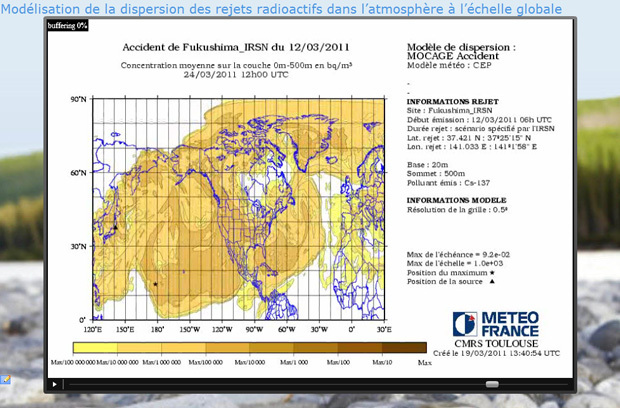 Povinec PP, Gera M, Holý K, Hirose K, Lujaniené G, Nakano M, Plastino W, Sý kora I, Bartok J, Gažá k M. Dispersion of Fukushima radionuclides in the global atmosphere and the ocean. Appl Radiat Isot. 2013; 81:383-92. 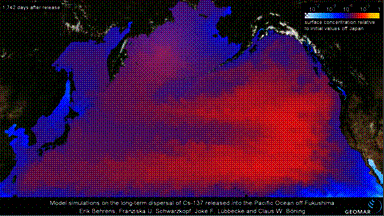 Buesseler KO, Jayne SR, Fisher NS, Rypina II, Baumann H, Baumann Z, Breier CF, Douglass EM, George J, Macdonald AM, Miyamoto H, Nishikawa J, Pike SM, Yoshida S：Fukushima-derived radionuclides in the ocean and biota off Japan. Proc Natl Acad Sci U S A. 2012; 109:5984-8.